As a tech innovator and powerhouse that it is known for, it is expected as a norm for Apple to come up with ever new and awesome gadgets that will be an instant hit in the markets. From the sheer and meticulous beauty of its designs to the useful practicality of functionalities, Apples products have never failed to amaze its avid fans and customers. It is no wonder that from the early stages of the company’s product development, eager watchers keep on looking for ways to keep themselves updated on the latest about Apple’s innovative lines. 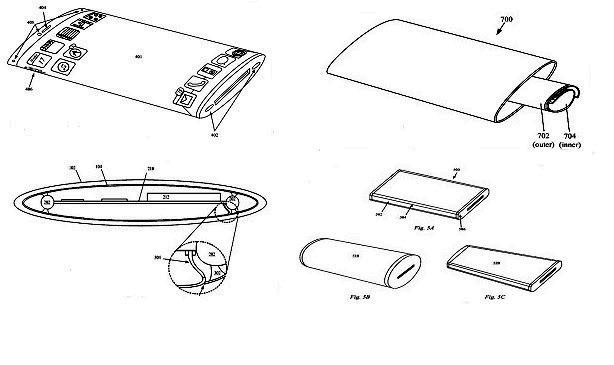 Last Thursday, Apple has made its mark again by securing a patent with the U.S. Patent and Trademark Office for a first-of-its-kind futuristic phone which can be described briefly as a futuristic portable electronic gadget featuring a flexible wrap-around AMOLED display, all-glass construction and facial recognition. According to Apple, traditional phone handsets are limited by the fact that they are planar in form. Such a planar form factor, as Apple calls it; is visually appealing and easy to handle, but it suffers from the lack of usable space, since it is only the front of the device that is actually used; while its sides and back area have no functional use at all except in few instances where the sides may be used as a space for some of the device’s control buttons. As its very own solution to this issue of unused space, Apple proposed a curved phone featuring a wrap-around display. This, the company states in its patent application, can be made possible by using a flexible AMOLED display that can be fitted into a transparent chassis by means of folding and inserting, and then unfolding or unrolling again. This makes way for the formation of a continuous band where different graphics including videos and photos can be displayed. Patent details include built in functions such as facial recognition and 3D capability that is possible thru a series of multiple displays layered on top of each other. The wrap around display does not only serve as a means for content consumption but also serves as the main user interface. Instead of physical buttons, gestures are used as a means of manipulating the volumes and controlling the device. This gives way for a seamless design of the device that is both easy to handle and pleasing to the sight. Apple also made special mention of the transparency of glass, considered highly essential in all internal wireless radio communications device. As a means of support, metal columns or other structural system can be disposed of within the chassis. With the reality that strong curved glasses is not a present possibility, it is not clear just when we Apple fanatics can see this exciting patent materialize into a tangible reality.